We live in mobile and connected world. It is important for you to have access to MGM notifications and status at any time, anywhere. That is why we created applications for most popular mobile platforms. MGM mobile application is easy to use and self explanatory. 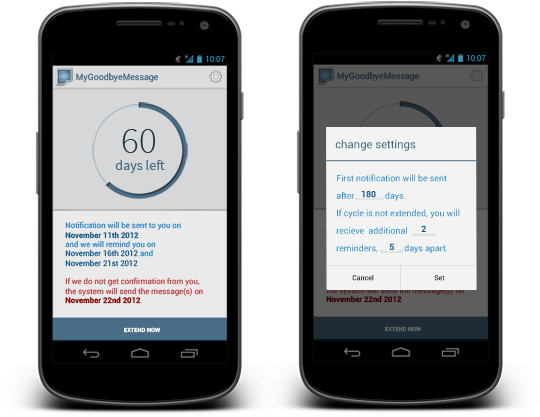 We created it using the same paradigms as in web application, including timer wheel and option to immediately postpone message delivery (extend notification cycle). 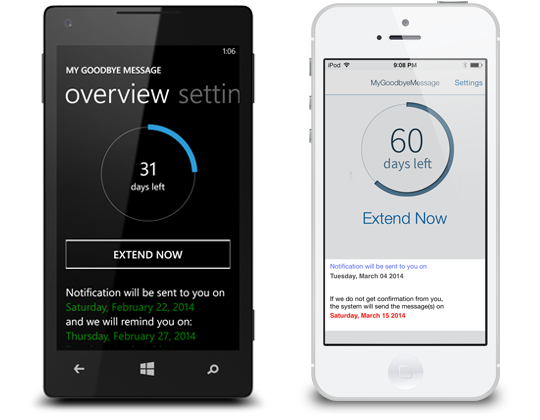 Mobile app can also be used to change your personalized notification settings. Easiest way to install MGM mobile application is from your phone. Just search your favorite store for the term "mygoodbyemessage". Another option is to click or tap one of the buttons bellow and send the application directly to the desired device.